Okay. I think the premise of Rejection Proof is obvious by the two subtitles. The book was a sort of memoir cross instruction manual cross pop psychology book. Jiang, an aspiring entrepreneur, became so overwhelmed by rejection that he chose to inoculate himself against the experience. For a hundred days, he set out to get rejected, and to blog the entire experience. He learned a lot about himself and about rejection along the way. This was a book-version of his experiences and lessons learned. Like most people, I’m terrified of rejection. 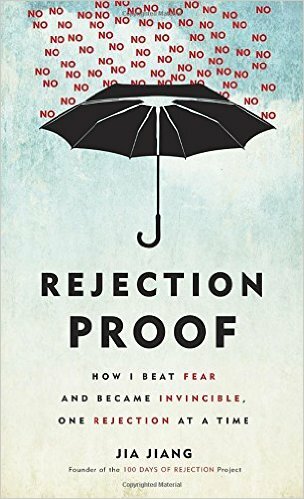 I don’t believe my reasons are the same as Jiang’s – at one point, he blows off fear of failure the same way some people blow off fear of rejection, and my fear of rejection is tied to my fear of failure – but the concept is the same. Reading about his journey was interesting, and it certainly taught me a few things. I didn’t agree with everything he wrote (see note about blowing off fear of failure) and I feel like his psychological analysis was only surface-level, but I also think he hit on a lot of points. There were plenty of things to jump from here, and to make me think it might be possible to improve my own relationship with rejection/fear/failure. That made the book worth reading. On the other hand, I wasn’t particularly fond of the audio performance by Mike Chamberlain. The performance made Jiang sound very brash at times, and for all I know, that may be the truth – it just wasn’t my favorite performance. This entry was posted in 2016, Adult, Prose and tagged Asia, audio, humor, nonfiction, POC, psychology. Bookmark the permalink.